Thirty years ago the Arthurian myth first grabbed hold of me when I saw Excalibur on its initial release. Prior to that, I’d encountered King Arthur only through the Disneyfied Sword in the Stone, or the bloodless Technicolor epic Knights of the Round Table. John Boorman’s 1981 film was different: limbs were hacked off, breasts were bared and there was a timeless sense of a blood-and-thunder past throbbing with life. Sure, it was stiff in places, and the acting was stylized to the point of ridiculousness, but it was still a movie in the pure sense, loaded with unforgettable images. Thirty years on, I still love the film, and not just for sentimental reasons. There’s a sure hand at work, one that knows exactly what it wants to accomplish with every shot and sequence. Boorman, who’d once tried to wrangle Lord of the Rings onto the screen as a live-action epic, is a fearless filmmaker as notable for his daring successes (Deliverance) as his audacious failures (Exorcist II: The Heretic). He depicts Arthur not as a neat or elderly monarch, but with the long hair and scruffy beard of a biker. Guinevere is an earthy princess who knows herbal remedies as well as courtly dances. Lancelot, in gleaming silver armor, has the curls and square jaw of a laid-back surfer. 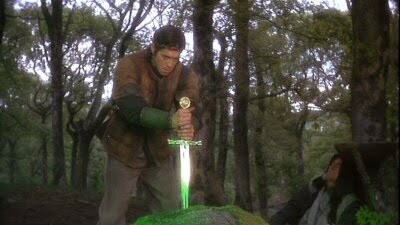 Boorman uses green backlight to give even the metal armor a hint of the organic, most beautifully during the emergence of the sword from the lake. The actors don’t perform so much as embody their roles, as the film tends to show them only at moments of high emotion. 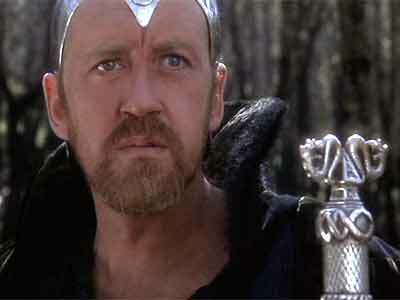 But the wild card is Nicol Williamson as Merlin. Whatever the behind-the-scenes process that arrived at this interpretation, Williamson is both the focal point and the most entertaining thing in the film. Using every possible range of his voice, clad in a silver skullcap and black ragged robes, he’s a buffoon one moment, a sage the next, and never less than enthralling. Whenever the film seems about to take itself too seriously, Williamson saves the day with a pratfall or a goofy line reading. I can understand why contemporary viewers might find it overblown and silly. In an age of ironic detachment, when everything has a wink-wink element, the worst offense is to take something seriously, and to unapologetically present a unique vision. Excalibur does exactly that. And if you let it cast its spell (which goes something like, “Anál nathrach, orth’ bháis’s bethad, do chél dénmha”) I think you’ll find yourself watching it again in another thirty years, too. All right, I love this movie. Even though they're wearing 18th Century armor (I cringe everytime I see that). You're right though, Alex, it's Merlin that makes this film so wonderful to watch. Perhaps one of my favorite movies of this type. I thought I was the only one who loved Nicol Williamson in it. I thought he was brilliant as Merlin. This is easily the greatest of all the Arthurian movies, no contest. Because it’s a legend, the style needs to be bigger then life and it doesn’t disappoint in that regard- beautiful scenes and the cast of actors is AMAZING. They certainly don’t make films like this anymore. This is the quintessential King Arthur movie. I don’t care if other people find it crazy or not. 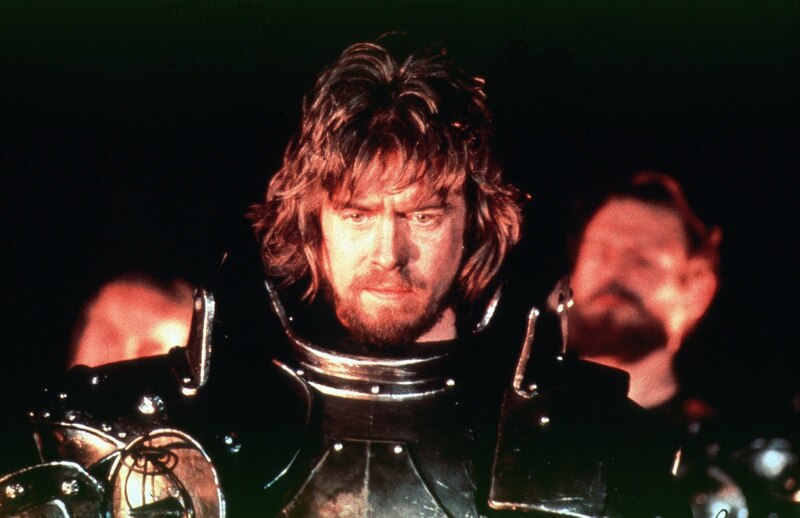 Lancelot will always be in that beautiful silver armor, and Nigel Terry is and always will be King Arthur. I can’t even begin to discuss the jaw-dropping gorgeousness of the sword rising from the lake. As one of my top 5 favorite films, I had been away from it for many years before revisiting it last year after learning of the death of Nigel Terry. Since then I seem to rewatch scenes almost weekly. Something about this film, mixed with the nostalgia of having loved it as a kid, has made it resonate with me all over again…yet in a different way now that I am in my own middle age. Perhaps it’s the idea of destiny, holding on to hope when all else seems lost or the inevitable facing of one’s own mortality. I love this film, and it’s always nice to see that there are others who appreciate it as well. Nice article. I know this blog was started during the ancient times, but i would love to add my two shillings. This by far is my favorite movie of all time, my mom wanted to kill my uncle when he brought my brother and I to see it at the ripe old age of 14. She got over it, but the impact of the movie always stayed with me, and truly sparked my imagination. I spent a few nerdy years playing Dungeons and Dragons and every few years I pull it up on my phone and watch when flying on a businees trip. Even at 51 years old the magic of the movie still speaks to me.